The previous gang of Holiday Hints for Handmade Gifts were all bags made of felted wool. I mentioned that I had more bags up my sleeve and this time they are either made from repurposed materials or have an eco-friendly purpose behind them. Pg 58: Tyvec Tote. This lightweight bag is made from 4 Tyvec mailing envelopes, printed with bubble wrap! Really fun to make and easy to roll up and take anywhere. Pg 120: Beach Bag. 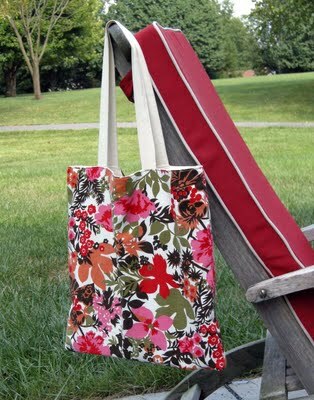 A set of 4 place mats and some cotton webbing become this sturdy, roomy beach bag. Pg 94: The Denim Shopper. 1 long denim skirt + 2 belts = a multi-pocketed, multi-pupose bag. 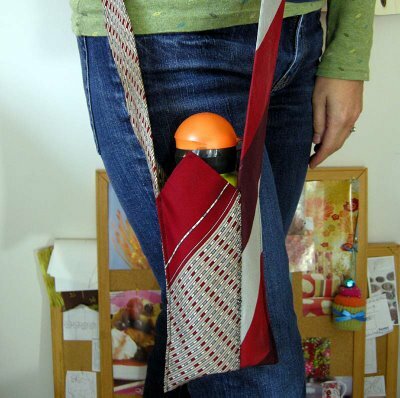 Pg 104: BYOB Water Bottle Sling. 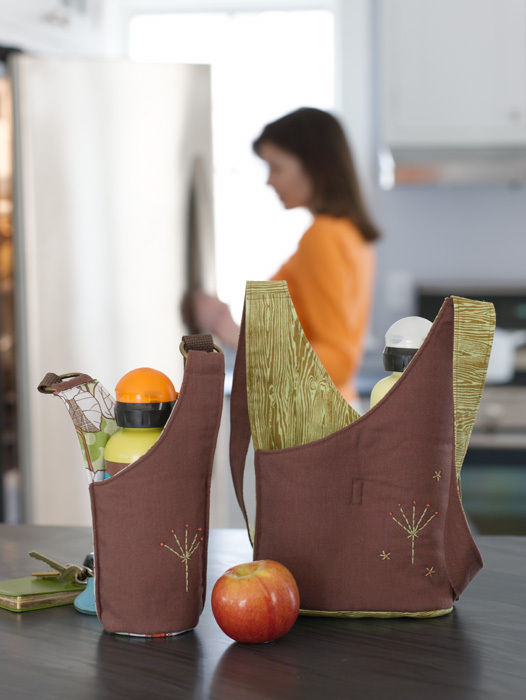 It’s so much easier to bring water with you when you’ve got a handy way to carry it. I designed them as a single or a double version to fit your style and needs. 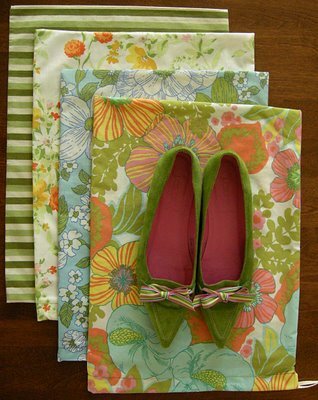 If you’d like to see what people have made from Sewing Green, be sure to check out the Sewing Green Flickr Group. 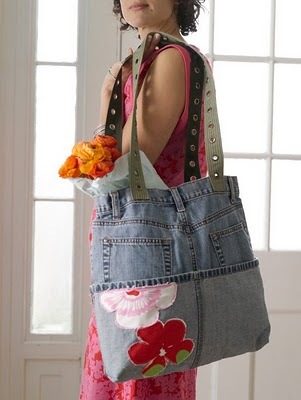 Need even more bag ideas? Here’s some free-bees, courtesy of my tutorial list in my sidebar. and one of my faves, the Two-Tie Sling, made from nuthin’ but 2 vintage neckties! Oh, look at the time! I better light a fire under my Holiday Hint feature if I hope to squeeze them all in before Christmas. Next my focus will be shifting to smaller, last minute ideas, so stay tuned! 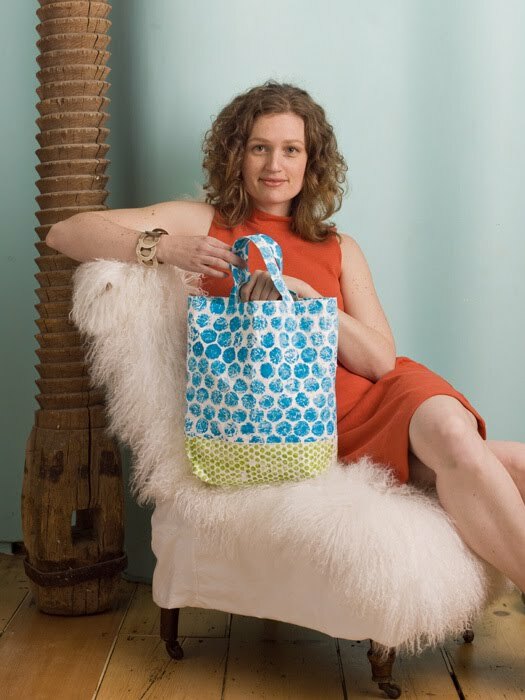 Book & Fabric Give-away at Burda Style! I have completely fallen in love with your “Warm Fuzzies” book, I’ll be doing a review on my blog, as soon as I make something from it. Now, it looks like I need to get Sewing Green also! Great ideas for Christmas gifts BUT quite inspirational projects for those much too long January and February days of winter! What a great idea for the promo tote rehab. I ahve so many of those and they stay hidden because they are ugly. No more! Love all the bag ideas. I have borrowed a few ideas for inspiration in my own bags. You can see a few on my blog. I love the tyvec tote! Very cute. I look forward to owning your books, soon. I LOVE all your work but especially the Tyvek bag!